To all old and new customers, Killtest has updated H12-221-ENU HCIP-Routing&Switching-IERS study materials to help you complete your HCIP-Routing&Switching-IERS(Huawei Certified ICT Professional-R&S-IERS) exam successfully. The current version for H12-221-ENU study materials is V17.02 with 435 real exam questions and answers. Compared with V16.02, there are more than 100 new questions were add. Newly updated H12-221-ENU HCIP-Routing&Switching-IERS Study Materials must be the best tool of passing Huawei HCIP-Routing&Switching-IERS H12-221-ENU exam. More than ensuring that you can pass H12-221-ENU exam, Killtest here answered some related Huawei questions to remove your worries. Where Can I Register My Huawei H12-221-ENU Exam? If you want to register your Huawei HCIP-Routing&Switching-IERS H12-221-ENU exam, please come to Pearson VUE for the further details. Most candidates are confused, because Huawei exams were registered at Prometric before. However, since October 2018, Huawei exam center was moved to Pearson VUE. You can't register your Huawei exams are Prometric anymore. Which is the correct category for H12-221-ENU exam, HCNP-Routing&Switching or HCIP-Routing&Switching? At the very start, we all know that the system of Huawei contains three levels, they are ICT infrastructure, ICT developer and ICT vertical. However, since January 2, 2019, Huawei system was upgraded as new three levels, which are ICT infrastructure, Platform and service and ICT vertical. It seems that ICT developer was replaced by Platform and service certification. For the Huawei categories, the previous three levels of Huawei certification were HCNA, HCNP and HCIE. After upgraded, Huawei offers three levels of certification: Huawei Certified ICT Associate (HCIA), Huawei Certified ICT Professional (HCIP), and Huawei Certified ICT Expert (HCIE). So you can find HCIP-Routing&Switching is the new category for H12-221-ENU exam, while HCNP-Routing&Switching is the old category. No matter which category you search on Killtest, you can find your correct exams for your certification. How many categories are upgrade by Huawei? From above figure, you can find it shown the new certification system of Huawei for you. 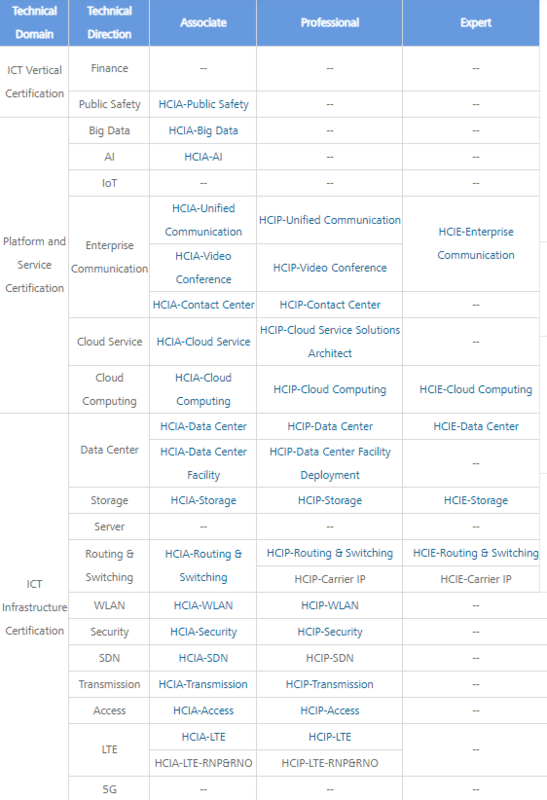 Compare to the old system, Killtest has collected that there were 26 categories updated, including Big Data, AI, UC, CC, VC, Cloud Service, Cloud Computing, Data Center Facility, Storage, Routing&Switching, Security, WLAN, Transmission, Access, LTE certifications. Once again, no matter the old categories or the new categories you search at Killtest, you can find your correct exams for reviewing, including Huawei H12-221-ENU exams. Getting updated H12-221-ENU HCIP-Routing&Switching-IERS Study Materials today for your HCIP-Routing&Switching certification now, Killtest help you have full confidence on the preparation. Also, if you wanna the other Huawei exam questions as preparation materials, just contact us online.